This spring was an incredibly tough season to photograph Evie & Ameer's engagement session. I think we rescheduled at least three times due to either the wind, rain or cold. That said, with just under two weeks until their wedding, we found a beautiful day in May. We started off at the couple's new Wicker Park home still under construction, which was a first for me. I enjoyed creating images in a place that, in a way, was a physical metaphor for their new life together. From there we headed north to the Chicago Botanic Gardens, which is one of my favorite locations in the Chicago area. I do not normally advise scheduling an engagement session this close to the wedding, but it was worth the wait since everything was in bloom. I'm looking forward to their wedding coming up at the Harold Washington Library! 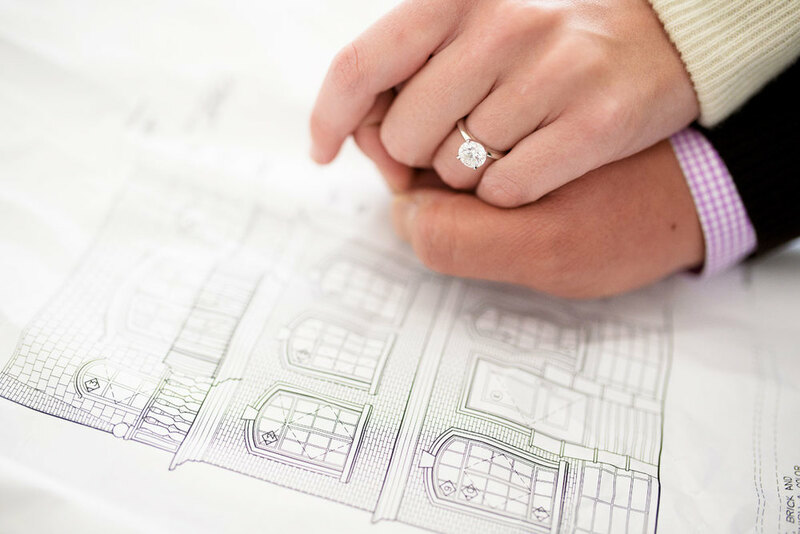 Couple looks at the blue prints of their Wicker Park home during their Chicago engagement session.